Santa Monica Homeopathic Pharmacy, originally founded as the Santa Monica Drug Company, opened on October 8 1944. 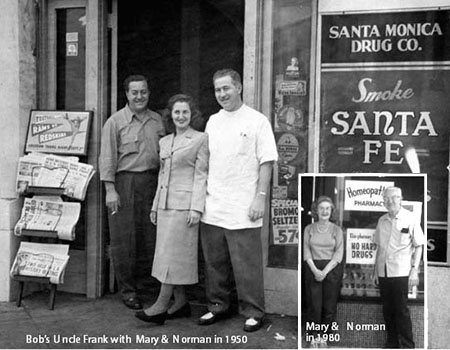 Owned and operated by Norman and Mary Litvak the store opened as a full service pharmacy in downtown Santa Monica on the corner of 4th and Broadway. Equipped with a soda fountain, prescription counter, cosmetic department, magazines, cigarettes, cigars, liquor, and candy, the pharmacy offered convenience to the people of Santa Monica. Not long after the store opened, a representative from Standard Homeopathic came to Norman with a box of odd-looking bottles filled with tiny pellets and tablets asking if Norman would be interested in selling them. Fortunately, Norman was familiar with the remedies due to studies he had in pharmacy school at the University of Buffalo. Confident with their knowledge of these items Mary and Norman felt their customers would benefit from these medicines. Beginning with one four-foot shelf of remedies, they introduced homeopathy to the community. In 1951, the pharmacy stopped selling alcoholic beverages. In the 1960’s the pharmacy stopped selling tobacco products and narcotic drugs. Snacks became healthier. In 1967, the Rights of Domain gave the city permission to move the pharmacy across the street. It was at this location the variety of homeopathic remedies increased. As the remedy shelves increased the dispensing of prescription drugs decreased. The Litvaks realized that although prescription drugs had their place, they are prescribed all too often and did not always resolve the underlying health complaint or help with the symptoms. They found that the patients of doctors recommending less toxic, more natural products maintained a better sense of well-being and a sense of vibrancy. Little by little, the store made major changes. Doing what they felt was in the best interest of their customers Mary and Norman were pioneering a new kind of pharmacy. They cared about their customers and took the time to listen, offering suggestions, encouraging changes toward a healthier life style, and making referrals to those physicians who practiced natural medicine. Mary and Norman’s eldest son, Don, began to help in the store on Saturdays, the store’s busiest day. Customers would drive from as far away as San Diego and Santa Barbara. In 1986, Don retired from his career as an Air Traffic Control supervisor and began to work full time in the store. Working side-by-side with his parents Don assumed the management of the pharmacy, while at the same time learning about the products and their uses. As the business grew so did the number of family members involved in the family business. . In 1988, Don’s son, Steven, came to work full time after selling a successful restaurant, which he owned and operated for several years. Having an excellent business sense, and a genuine interest in the field it did not take long for him to further the development of the store's products and services. Always a stickler for convenience he installed a mail order system in order to serve customers throughout the country. Don’s daughter, Debbie, began to work part-time while in college. She serves in customer service, handling telephone customers and offering suggestions about dietary habits. As the store flourished, additional help was required to maintain customer service. In 1989 Steve’s wife, Kim, left a position in banking and began working full time in the pharmacy. Her meticulous record keeping and organizational skills were put to good use. The need for uniformity and the growth of the staff led her to produce the employee manuals and develop training procedures. Considered the visionaries of the store, both Steve and Kim focus on education. Guided by Dr. Trevor Cook, they received their diplomas in homeopathy from the British Institute in 1992. Steven and Kim pursue educating the staff and community through store seminars. In 1992 Mary and Norman’s other son, Bob, began working full-time at the pharmacy. Previously he worked twenty years providing programs and services in youth camps and community centers through the country. The skills he brought included public relations, personnel management and a strong belief that serving the needs of the customers is what set Santa Monica Homeopathic Pharmacy apart from its competitors. Both of Bob’s children, Dusty and Shira, worked the pharmacy while in school. As a family run business with three generations working side by side the store outgrew the space available at its 4th street location. The Northridge earthquake in January 1994 provided another challenge and incentive to move. During Labor Day weekend, we moved to our present location at the corner of 7th and Broadway, immediately growing from 900 square feet to 1800. Two years later, we expanded to nearly 3000 square feet. In 1992, due to the success of his efforts to advance the use of homeopathic remedies, Norman received an honorary degree from the British Institute of Homeopathy. Over the years, the products and services we offer have expanded. In addition to homeopathic remedies from around the world, we offer Western and Chinese Herbs, Vitamins, Minerals, Glandulars and Amino Acids, a Variety of Interesting Books, Tasty Teas, Aromatherapy, Quality Skin Care Products, and Unique Gift Items. To meet the needs of our customers we have added staff with knowledge and education in Homeopathy, Nutrition, Western Herbs, Chinese Herbs, Acupuncture and Chiropractic philosophies. Journalists and news media from local and worldwide publications, as well as customers from all over the globe have visited our store. We generously share our interest and knowledge on the benefits of complementary medicine. Santa Monica Homeopathic Pharmacy has become a model for integrated pharmacies throughout the world. Its success can be attributed to many factors but primarily due to the principles that Mary and Norman instilled in the family and staff working at the pharmacy: the commitment to provide KNOWLEDGE, CARE, INTEGRITY & SERVICE for their customers. We extend an open invitation for you to visit the pharmacy, talk with our knowledgeable staff and experience what many feel to be one of the most unique specialty stores in the nation. We look forward to meeting you and wish you health and happiness always. We have the most skilled staff in the nation. Knowledge is our greatest attribute.